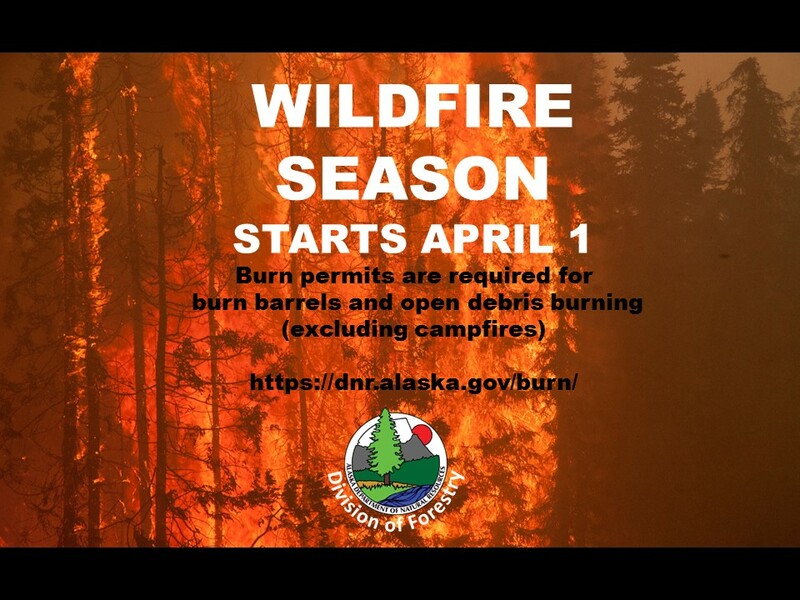 With drier spring and summer weather fast approaching, the Alaska Division of Forestry reminds residents they must get a permit before burning debris in the open or in burn barrels, starting April 1 in areas under state wildland fire protection. Residents must obtain a new permit at the start of each season, which runs from April 1 through August 31. Burn permits are free at state forestry offices and most local fire departments, or can be downloaded and printed at http://www.forestry.alaska.gov/burn. This website is a key resource for learning about safe burning practices in Alaska. As some municipalities do not allow burn barrels or debris burning, regardless of whether a resident has a state burn permit, residents should check with their local forestry office or fire authorities to determine if burning is allowed in their area at all. For more information, contact Alaska Division of Forestry Public Information Officer Tim Mowry at 907-356-5512 or tim.mowry@alaska.gov.